192-carat cut Paraiba soon to set new Guinness World Record (2009) Jewellery News Asia, n. 303, p. 51. Arif, Mohammad; Henry, Darrell J.; Moon, Charlie J. (2010) Cr-bearing tourmaline associated with emerald deposits from Swat, NW Pakistan: Genesis and its exploration significance. American Mineralogist, v. 95, n. 5-6, pp. 799-809. Beautiful Paraiba tourmaline remains rare and expensive (2012) Bangkok Gems & Jewellery, v. 25, n. 6, pp. 76-77. Befi, Riccardo; Simmons, William B.; Falster, Alexander U. (2009) Gem news international: New tourmaline production from Keffi, Nigeria. Gems & Gemology, v. 45, n. 3, pp. 227-228. Benesch, Friedrich; Wöhrmann, Bernhard. (2003) The tourmaline: a monograph. Urachhaus, Stuttgart. Blauwet, Dudley (2009) Tan Lap tourmaline mine, Northern Vietnam. Mineral News, v. 25, n. 3, pp. 5, 12. Bosi, Ferdinando; Balic-Zunic, Tonci; Surour, Adel A. (2010) Crystal structure analyses of four tourmaline specimens from the Cleopatra’s Mines (Egypt) and Jabal Zalm (Saudi Arabia), and the role of Al in the tourmaline group. American Mineralogist, v. 95, n. 4, pp. 510-518. Chemical variations in multicolored "Paraiba"‑type tourmalines from Brazil and Mozambique : implications for origin and authenticity determination. (2009) GRE GemResearch Swisslab, Lucerne, Switzerland. Deng, Chang-jie; Wang, Duo; Xu, Bin; Bai, Fan (2009) Research on filling treatment of tourmaline. Journal of Gems & Gemmology, v. 11, n. 3. Diagenetic uvite with overgrown dravite; Bigelow, St. Lawrence County, New York (2010) Rocks & Minerals, v. 85, n. 2. Drucker, Richard B. (2010-2011) Market trends: Paraiba tourmaline. Gem Guide: Gem Market News, v. 30, n. 1, p. 16. Durgin, Dennis; Clanin, Jim ( 2011) Gem news international: Tourmaline finds at Mt. Marie, Paris, Maine. Gems & Gemology, v. 47, n. 1, pp. 66-67. Ertl, Andreas; Kolitsch, Uwe; Meyer, Hans-Peter; Ludwig, Thomas; Lengauer, Christian; Nasdala, Lutz; Tilmanns, Ekkehart (2009) Substitution mechanism in tourmalines of the "fluor-elbaite"-rossmanite series from Wolkenburg, Saxony, Germany. Neues Jahrbuch fur Mineralogie Abhandlungen, v. 186, n. 1, pp. 51-61. Ertl, Andreas; Marschall, Horst R.; Giester, Gerald; Henry, Darrell J.; Schertl, Hans-Peter; Ntaflos, Theodoros; Luvizotto, George L.; Nasdala, Lutz; Tillmanns, Ekkehart (2010) Metamorphic ultrahigh-pressure tourmaline: Structure, chemistry, and correlations to P-T conditions. American Mineralogist, v. 95, n. 1, pp. 1-10. Ertl, Andreas; Rossman, George R.; Hughes, John M.; London, David; Wang, Ying; O'Leary, Julie A.; Dyar, M. Darby; Prowatke, Stefan; Ludwig, Thomas; Tillmanns, Ekkehart (2010) Tourmaline of the elbaite-schorl series from the Himalaya Mine, Mesa Grande, California: a detailed investigation. American Mineralogist, v. 95, n. 1, pp. 24-40. Ertl, Andreas; Schuster, Ralf; Hughes, John M.; Ludwig, Thomas; Meyer, Hans-Peter; Finger, Friedrich; Dyar, M. Darby; Ruschel, Katja; Rossman, George R. (2012) Li-bearing tourmalines in Variscan granitic pegmatites from the Moldanubian nappes, Lower Austria. European Journal of Mineralogy, v. 24, pp. 695-715. Fisher, Jesse (2011) Mines and minerals of the Southern California pegmatite province. Rocks & Minerals, v. 85, n. 1, pp. 14-34. Genis, Robert (2010) New Nigerian red tourmaline find. Gemstone Forecaster, v. 28, n. 1, pp. 2-3. Gübelin, Eduard J. and John I. Koivula (2004) Photoatlas of Inclusions in Gemstones, [Volume 1]. 4th ed., Opinio Publishers, Basel. Gübelin, Eduard J. and John I. Koivula (2005) Photoatlas of Inclusions in Gemstones, Volume 2. Opinio Publishers, Basel. Hamlin, Augustus C. (2004) The tourmaline. Rubellite Press, New Orleans, LA. Hawthorne, Frank C.; Dirlam, Dona M. (2011) Tourmaline the indicator mineral: from atomic arrangement to Viking navigation. Elements, v. 7, pp. 307-312. Koivula, John I. (2009) Lab notes: Tourmaline with silver and gold chatoyancy. Gems & Gemology, v. 45, n. 2, pp. 139-140. Koivula, John I.; Nagle, Kevin G.; Owens, Philip A. (2008) Lab notes: Induced copper contamination of tourmaline. Gems & Gemology, v. 44, n. 4, pp. 367-368. La tormalina cuprifera del Brasile = The dupriferous tourmaline of Brasil (2012) 18 Karati, n. 157, pp. 96-98. Lauf, R. J. (2011) Collector's guide to the tourmaline group. Schiffer Publishing Ltd., Atglen, PA.
Laurs, Brendan M. (2009) Gem news international: "Lilac"-colored Cu-bearing tourmaline from Nigeria. Gems & Gemology, v. 45, n. 3, pp. 228-. Laurs, Brendan M. (2009) Gem news international: New find of pink-to-red tourmaline in Nigeria. Gems & Gemology, v. 45, n. 4, p. 305. Liu, Xue-Liang; Fan, Jian-Liang; Guo, Shou-guo (2010) Study of the spectroscopic characteristics of tourmaline crystals form Xinjian Province. Journal of the Gemmological Association of Hong Kong, v. 31, pp. 85-91. Lucas, Andy (2012) Gem news international: Bicolored tourmaline imitation. Gems & Gemology, v. 48, n. 1, pp. 59-60. Lussier, A. J.; Hawthorne, Frank C.; Herwig, S.; Abdu, Y.; Aguiar, P. M.; Michaelis, V. K.; Kroeker, S. (2009) Mushroom elbaite from the Kat Chay mine, Momeik, near Mogok, Myanmar: II. Zoning and crystal growth. Mineralogical Magazine, v. 72, n. 5, pp. 999-1010. Lussier, Aaron; Hawthorne, Frank C. (2011) Oscillatory zoned liddicoatite from Anjanbonoina, central Madagascar. II. Compositional variation and mechanisms of substitution. Canadian Mineralogist, v. 49, n. 1, pp. 89-104. Marschall, Horst R.; Jiang, Shao-Yong (2011) Tourmaline isotopes: no element left behind. Elements, v. 7, pp. 313-320. Mauthner, Mark (2011) Oceanview update. Rocks & Minerals, v. 86, n. 3, p. 203. Mauthner, Mark (2011) Recent finds at the Oceanview Mine. Rocks & Minerals, v. 85, n. 1, pp. 41-47. McClure, Shane F.; Kane, Robert E.; Sturman, Nick (2010) Gemstone enhancement and its detection in the 2000s. Gems & Gemology, v. 46, n. 3, pp. 218-240. Merkel, Paul B.; Breeding, Christopher M. (2009) Spectral differentiation between copper and iron colorants in gem tourmalines. Gems & Gemology, v. 45, n. 2, pp. 112-119. Milisenda, Claudio C.; Wehr, K. (2009) Trapiche tourmaline from Zambia. Gemmologie: Zeitschrift der Deutschen Gemmologischen Gesellschaft, v. 52, n. 3/4, pp. 81-82. Monaco, James; Monaco, Jeannett (2010) Tourmaline and other treasures: collecting opportunities are abundant in Maine. Rock & Gem, v. 40, n. 6, pp. 50-52, 54, 56. Natkaniec-Nowak, Lucyna; Dumanska-Slowik, Magdalena; Ertl, Andreas (2009) "Watermelon" tourmaline from the Paprok mine (Nuristan, Afghanistan). Neues Jahrbuch fur Mineralogie Abhandlungen, v. 186, n. 2, pp. 185-193. Pardieu, Vincent; Jacquat, Stephane; Bryl, Lou Pierre; Senoble, Jean Baptiste (2009) Gem news international: Update on Cu-bearing tourmaline mining in Mozambique. Gems & Gemology, v. 45, n. 4, pp. 304-305. Perkins, Jim (2010) Off the dop: tourmaline. Rock & Gem, v. 40, n. 3, p. 52. Pezzotta, Federico; Laurs, Brendan M. (2011) Tourmaline: the kaleidoscopic gemstone. Elements, v. 7, pp. 333-339. Praszkier, Tomasz (2010) Gem tourmaline crystals from Madagascar. Vug, v. 3, n. 1, pp. 25-33. Rossman, George R. (2011) Gem news international: Origin of color in tourmaline from Mt. Marie, Maine. Gems & Gemology, v. 47, n. 1, pp. 67-68. Rubellite: Seductive gem (2010) Joia & Cia, v. 11, n. 65, pp. 42-49. Saeseaw, Sudarat; Scarratt, Kenneth; Emmett, John L. (2009) Potential for diffusing copper into tourmaline: preparation for initial experimentation. GIA Website. Serras-Herman, Helen (2011) Touring the Pala tourmaline mines. Rock & Gem, v. 41, n. 10, pp. 28-32. Shao, Xiao-lei; Di, Jing-ru; Ding, Li (2011) Tentative study on lead glass-filled tourmaline. Journal of Gems & Gemmology, v. 13, n. 3. Shigley, James E.; Laurs, Brendan M.; Janse, A. J. A. Bram; Elen, Sheryl; Dirlam, Dona M. (2010) Gem localities of the 2000s. Gems & Gemology, v. 46, n. 3, pp. 188-216. Shull, Richard M. (2010) Tourmaline: a gemstone of many colors. Art Jewelry, v. 6, n. 2, p. 23. Slack, John F.; Trumbull, Robert B (2011) Tourmaline as a recorder of ore-forming processes. Elements, v. 7, pp. 321-326. Tappen, Christine M. (1998) Beryl and tourmaline mineralization of the Crabtree pegmatite, Spruce Pine District, North Carolina. The history of Maine tourmaline. (1987) Cross Jewelers, Portland, ME. 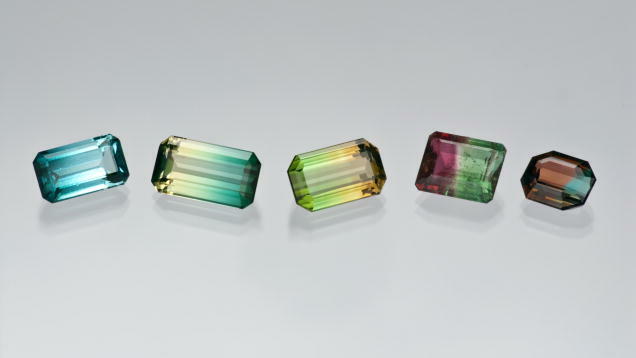 Tourmaline: a gemstone spectrum. (2002) Christian Weise; München, Germany. Tourmaline: A rainbow in all seasons (2012) Jeweller, pp. 17-18. Tourmaline: The Rainbows stones (2012) Le Bijoutier, n. 795, pp. 62-63. Treasure chest: Cynthia Renee's cuprian tourmaline suite (2012) MJSA Journal, v. 7, n. 6. Turmalin: rentgenografiia i tipomorfizm. (1990) 'Nauka," Sibirskoe otd‑nie, Novosibirsk. van Hinsberg, Vincent J.; Henry, Darrell J.; Dutrow, Barbara L. (2011) Tourmaline as a petrologic forensic mineral: a unique recorder of its geologic past. Elements, v. 7, pp. 327-332.
van Hinsberg, Voncent J.; Henry, Darrell J.; Marschall, Horst R. (2011) Tourmaline: an ideal indicator of its host environment. Canadian Mineralogist, v. 49, n. 1, pp. 1-16. Weil, Alice (2012) Seeing red. SAJN. White, John S. (2011) Some thoughts about tourmalines (and garnets). Rocks & Minerals, v. 85, n. 1, pp. 69-70. Zagorsky, V. E.; Peretyazhko, I. S. (2005) Turmaliny Malkhzna: = Tourmalines of Malkhan. Ottisk, Irkutsk. Learn more about GIA's rare book collections. Learn more about a museum exhibit that showcased rare book pages on gems, minerals, and natural science.